Sun Realty's "Don't Miss List"
Planning a Corolla, NC vacation? Be sure to check out these activities and attractions! Currituck Beach Light Station. This distinctive brick lighthouse is located just north of Corolla on Highway 12. The Currituck lighthouse is usually open for climbing during daylight hours from March through Thanksgiving for a small fee. The climb to the top is well worth it - the view is incredible! Pine Island Audubon Sanctuary. The best way to explore the 5000 acre Audubon Sanctuary is by kayak. You may see birds, deer, many varieties of plant life, rabbits, and other forms of wildlife. The Whalehead Club. 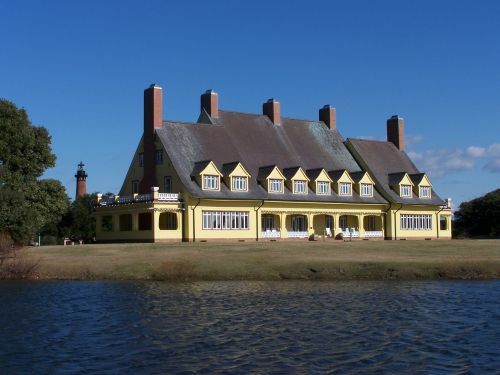 Listed on the National Register of Historic Places, this spectacular 1920s hunt club is located in the shadow of the Currituck Beach Lighthouse. It was recently restored to its original splendor, including art nouveau architectural styling accented with Tiffany lamps and cork-tiled floors. Tours are available. Outer Banks Center for Wildlife Education. One of the best kept secrets on the Outer Banks! This facility offers free and fun activities for all ages; everything from fishing, to nature walks, to wildlife photography, to kayaking. Be sure to check out the calendar of events and sign up in advance. Located near the Whalehead Club in Heritage Park. Historic Corolla Village. Take time to wander through the sandy roads of Historic Corolla Village. You'll find the charming Corolla Chapel and a Schoolhouse that has now been converted into the Wild Horse Museum. There are also several historic homes that have been revitalized into shops. Historic Corolla Village is located on Schoolhouse Lane - just across from Sun Realty's Corolla office. Whalehead Club Wine Festival Wednesdays. Every Wednesday from early June to mid-September from 3 to 6:45 pm, join the fun atWhalehead in Historic Corolla. For $15 you'll receive a souvenir wine glass to taste local wines and wines from around the world. Admission is free for children and non-drinking adults. Live music, food vendors and and plenty of space for the kids to run around makes this a family friendly place to catch the sunset over the Currituck Sound. Bring a picnic blanket and relax on the lawns of Currituck Heritage Park. Read to explore every place on the list? Begin planning your Corolla, NC vacation today! Helpful OBX Vacation Specialists are also available 7 days a week to assist. Give us a call at 1-888-853-7770.